Fall has arrived and we’re getting a taste of crisp breezes and fallen leaves. As we prepare to shut down the air conditioning and trade our open windows for cozy blankets by the fire, it’s important to give your HVAC system some attention. Maintenance and seasonal tune-ups at the onset of heating season is recommended to ensure your system works properly and efficiently throughout the fall and winter. If you haven’t had your system checked out in a while, now is the time to schedule service! Related: Why is HVAC system maintenance so important? This time of year has most of us thinking about the holidays ahead. Events, traditions, gatherings and all the other festivities we have on the calendar add up to quite the hustle and bustle. It may also mean big meals to cook, parties to host and house guests to accommodate—each of these can put extra strain on your plumbing system. It’s unfortunate, but inevitable that you may encounter a plumbing emergency while decking the halls with family and friends. Holiday meals create a busy kitchen. This is where most of the work happens, and if you’re lucky you’ve got some extra hands to help. Your best line of defense for avoiding clogged drains and smelly garbage disposals is to keep a trashcan accessible at all times. When too much grease and oil makes its way down the drain it can harden, creating a stubborn blockage. Food particles like eggshells, chicken skin, bones, rice, even fruit and vegetable peels have no business in the drain either. Save your sink for rinsing dishes and filling pots; dispose of food scraps and cooking liquids in the trash can. Remember—if it’s a liquid that can solidify, like grease or oil, or food that a disposal can’t properly grind, it has no place down the drain! Hosting house guests or a holiday party this year? Your bathrooms will undoubtedly see quite a bit of use. Although you can’t oversee people’s bathroom visits, you can prepare the area to prevent plumbing disasters. Instead of setting out festive disposable napkins that could end up getting flushed, opt for hand towels. It’s also recommended that you fix bathroom leaks and drain blockages in tubs and showers before family arrives. The extra use of plumbing fixtures, combined with bath products, soap scum and stray hair from all those showers can really speed up the rate at which fixtures leak and drains clog. A plunger can be your best ally for toilet and drain clogs should the need arise, so keep one handy! Use a sink strainer or disposal stopper over the kitchen drain to prevent food waste and particles from going down. Push waste further down the drain line by running cold water for up to 30 seconds after using the garbage disposal. Run heavy water-consuming appliances like the dishwasher and washing machine at nighttime to maintain optimal water pressure. Ensure there is plenty of hot water for showering and bathing by adjusting the temperature on your water heater. If you’re going out of town and expect temperatures to drop, open cabinet doors to allow warm air to circulate and prevent frozen pipes. Familiarize yourself with the location of your water shut-off valves—in the event of a plumbing emergency like a frozen pipe or overflowing fixture, this is the first thing you’ll need to do. Blocked up sink, clogged drain or leaking fixture? Carroll Plumbing & Heating Inc. has you covered! Whether it’s a repair the day after Thanksgiving, or you simply want to take a proactive approach to prepare your plumbing for the holidays, our experienced plumbers can help. 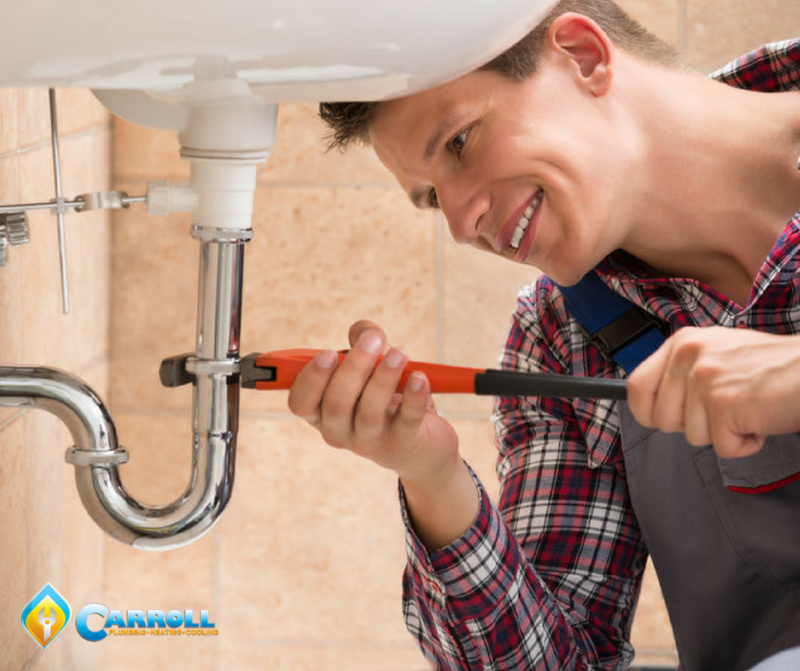 To learn more about keeping your kitchen and bathroom plumbing going with the flow, or to schedule an appointment, contact Carroll Plumbing & Heating Inc. today!